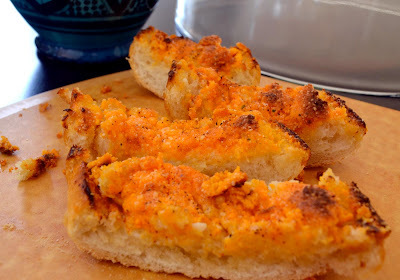 Chick 101-Football for Girls: "The World's Greatest Garlic Bread"
producers, and anyone else in the industry. In the 60's it was common to come in for lunch and find the place filled with costumed cowboy and indian extras having lunch." Rumor has it that when George Clooney was a fledgling actor on ER, he would often grab lunch at The Smokehouse. 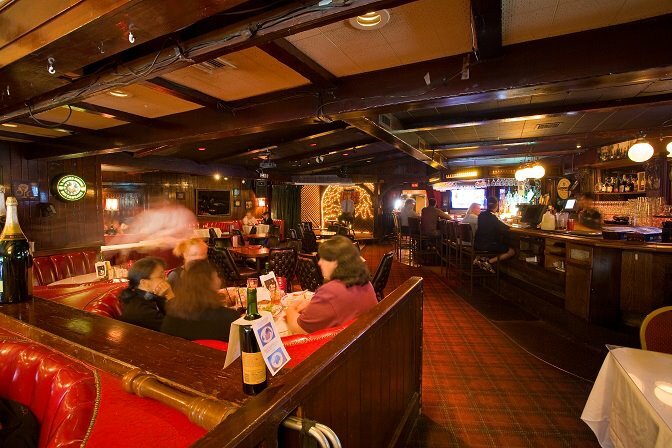 And let me tell you, if you walk in today, the place is stuck in a time warp--very dark, shiny red booths, lots of dark wood and the obligatory signed headshots of movie stars...and I wouldn't have it any other way. So they have this garlic bread. It is bright orange, somewhat nuclear looking and literally one of the most addicting substances on the planet. We've always wondered what sort of ingredients would go into the cheese mixture that made the taste turn out so bizarrely incredible. Now we have the internet and with just a couple of clicks, you can definitely make an educated guess. I have to say, it kind of ruined the magic, BUT seeing as how I now live far away, the fact that I can almost re-create it whenever I want makes up for that. I spent last weekend playing around with a couple different recipes that I found online (and possibly gained 5 lbs or so while trying) and have come up with my favorite version which I'll share with you here. A couple of disclaimers: 1) This is not healthy, low calorie or gluten-free. 2) I don't claim to actually have the recipe, but it tastes really, really similar. 3) Cooking times are approximate, this is one of those recipes where you should stay by the oven and watch the bread so it doesn't burn. And here we go! 1) Start with an artisan loaf of sour dough bread. Not a puny baguette, but a wide loaf. This recipe is for HALF A LOAF. If you want to make the full loaf, double the recipe. Cut the loaf in half and then cut it down the middle and open to make 2 halves. 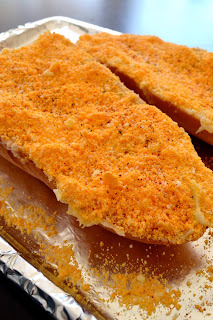 Place it on a baking sheet lined with parchment paper or aluminum foil. 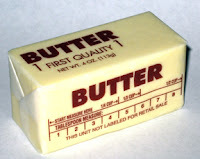 2) 7 TBSP butter (almost a whole stick) Place the butter in a bowl and microwave or heat in a saucepan over medium heat until almost melted. I use Gourmet Garden Chunky Garlic garlic blend. Stir this into the butter until well combined and let sit for a couple of hours (or as long as you can). Some recipes say to use minced garlic and then let the butter/garlic mixture sit out at room temperature overnight. If you can't find garlic in a tube, then try this method. I, for one, have no patience for letting anything sit overnight so I've found that this type of garlic permeates the butter pretty fast. 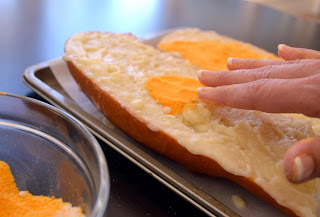 Re-heat to a soft consistency (not totally melted) if necessary and spread on the two halves of bread. Get in all the little crevices. Don't be shy. Don't think about it, just do it! 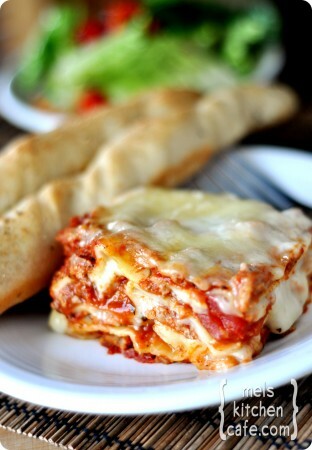 You can substitute grated parmesan if you want to, it also comes out really nice. 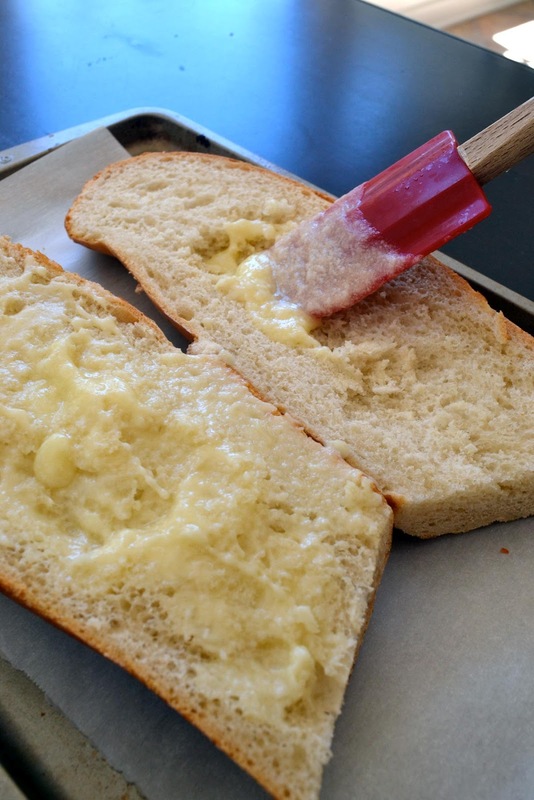 Mix these two cheese-like substances in a small bowl and spread over the bread. What I've found works best is to sort of "mush" the cheese mixture down into the butter a little bit. Don't do it too hard, you still want it to look fluffy. 5) Sprinkle on a little garlic salt, pepper and a little bit of cayenne pepper if you are so inclined. This is what it should look like right before it goes in the oven. In a preheated 350 degree oven, pop the loaves in for about 5-7 minutes. Like I said, don't leave the oven...all ovens are different and you don't want them to burn. Put them in again for about 30 seconds to 1 minute. DO NOT WALK AWAY! The bread can burn pretty fast and then you would be so sad. When the edges are just brown and the cheese is kinda bubbly and melty looking, take them out to cool. And voila! Cut the bread into slices and serve with your favorite dish! 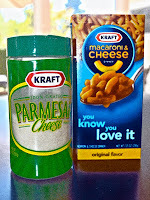 Last weekend I paired them with a fabulous lasagna from a recipe I found on Mel's Kitchen Cafe. INSANELY good as well. I'm dedicating this blog to the Jackman side of my family who knows all about this magical bread, our amazing Disney history and the wonders of Burbank. :) Cheers, Jackmans!!! you can buy that cheese powder without the noodles..lol. same stuff. 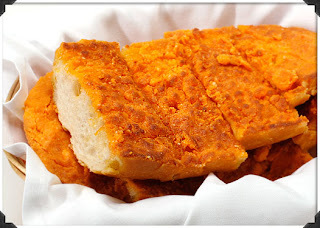 but the deal with this garlic bread is the bread itself.. cake-like Italian bread.. can't be duplicated..if you can get that to work out then that would be amazing!! 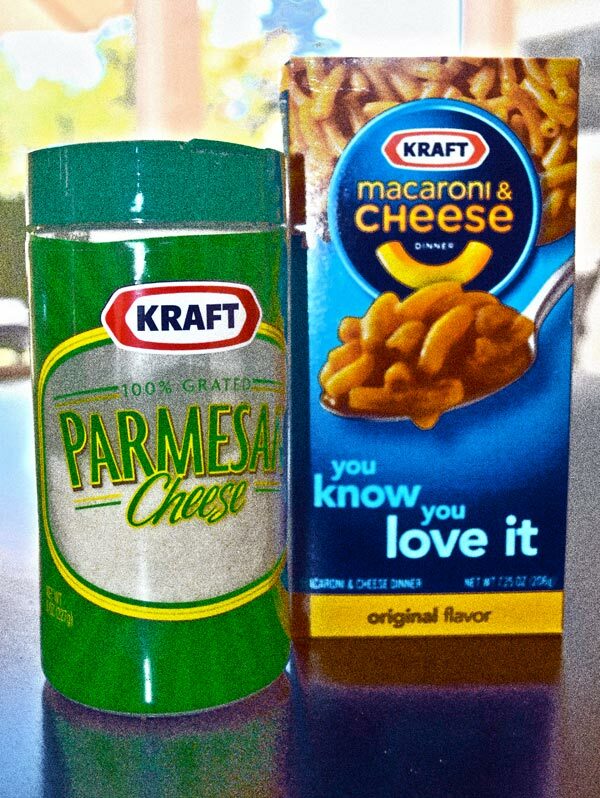 Awesome, where can you get the cheese powder without the noodles? I'd love that. Also, you're right about the bread being very important. 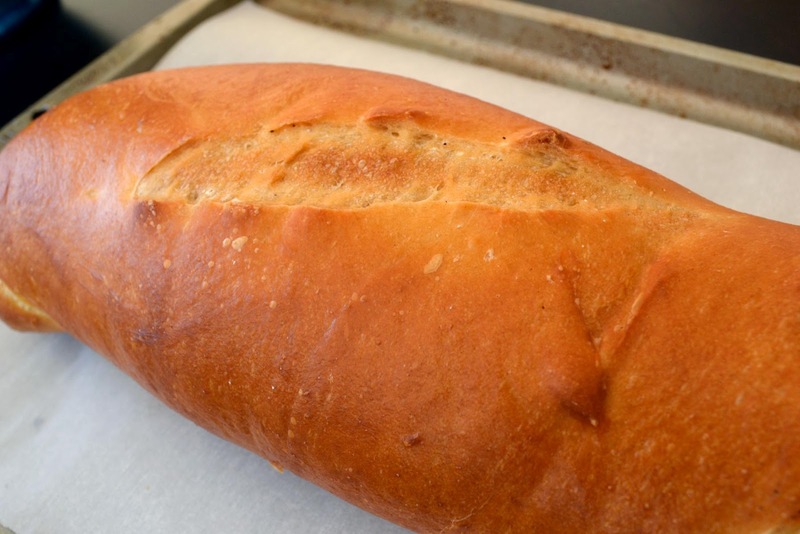 We've messed around with the recipe and find that we actually prefer French bread to Sourdough. I'll have to be on the lookout for cake-like Italian bread recipes. Thanks!! Having eaten a half load of this bread just last night, I'm convinced it's not just butter. It tastes like smoky steak. I think they drizzle steak grease on the bread, too, at some point before it's baked. Kinda gross to think about, but tasty result. It's not the same neon yellow color, but I buy my cheese powder from King Arthur Flour and it is Cabot Cheddar Shake. I use it on popcorn, on toast, with pasta... mmm! So going to try your recipe, thanks!! I worked at the SmokeHouse Restaurant and love the garlic bread. This recipe is very close. I have often thought about having them FefEx me some bread because I miss it LOL. We used to order this bread uncooked and uncut and take it home and freeze it. Take out when you need it and follow directions. Still tastes awesome. The Smoke House now ships their bread- you can call them or go to the site & get a copy of the order form. In the meantime, I'm gathering all of the ingredients for my wife to start putting this recipe to work in our home- Thank you so much!